Carolina Borja and Amy Toscani together take home $5,000 and a spot in 250 Monroe for their collaborative installation presented at the third annual Pitch Night Minneapolis. 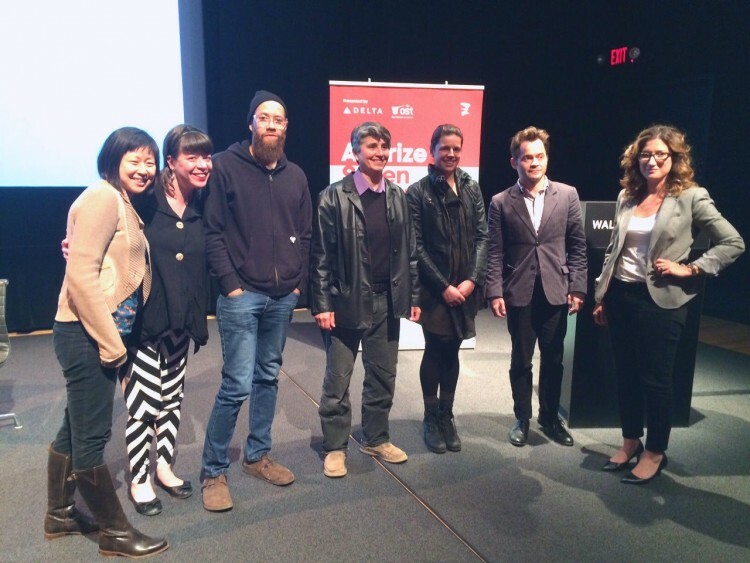 GRAND RAPIDS, Mich., MAY 19, 2015 – ArtPrize, the radically open international art competition in partnership with the Walker Art Center, Delta Air Lines, and Open Systems Technologies, tonight announced the Pitch Night Minneapolis winning entry. "Constructing on Deconstructing" by Carolina Borja and Amy Toscani wowed the judges at the third annual Pitch Night event held at the Walker Cinema. The collaborative project will take home the $5,000 cash award and a guaranteed space at 250 Monroe, adjacent to the DeVos Place Convention Center and a new venue for ArtPrize Seven. Borja and Toscani were selected from among five artists who were invited to present their ideas for the 250 Monroe space to a panel of five judges and a live audience. Each artist was given five minutes and five slides to sell their idea to the panel of local arts professionals, including: Joan Vorderbruggen, Cultural District Arts Coordinator for the Hennepin Theatre Trust; Christina Chang, Curator of Engagement at the Minnesota Museum of American Art; Fionn Meade, Artistic Director at the Walker Art Center; Nate Young, Artist and Co-Founder of The Bindery Projects; and Jehra Patrick, Program Director, Mn Artists and Visual Artist and Curator of the Waiting Room Gallery. The Minnesota-based artists will install their sculptural piñatas across half of the vast, blank canvass of space on the second floor of 250 Monroe in downtown Grand Rapids. The work beautifully combines the skills and backgrounds of Borja—whose work reflects a collision between customs and traditions—and Toscani, whose large-scale works are often whimsical, and speaks to the junction of cultures between Mexico and the U.S. In 2013, ArtPrize launched Pitch Night at the Walker Arts Center to discover exciting, ambitious projects and to reduce the barriers that out-of-state artists face in bringing them to the annual competition. Pitch Night expanded to Cincinnati in 2014 in partnership with 21c Museum Hotels—a partnership that will continue in 2015 with Pitch Night Durham, held at the 21c Museum Hotels’ Durham, North Carolina location on June 3. Additionally, Pitch Night has further expanded to include an event in Indianapolis, to be held at the Indianapolis Museum of Art on June 10. Each of these three events will award the winning artist $5,000 and a spot in a prominent ArtPrize venue during the seventh annual event. ArtPrize Seven will take place across downtown Grand Rapids, Michigan from September 23 to October 11, 2015. Artist registration for the seventh annual event will remain open through June 4. Photo: Pitch Night Minneapolis winning artists Carolina Borja and Amy Toscani (third and fourth from the right) with the panel of five jurors.